Nothing says summer like the delicious hydrating taste of a cool watermelon! Kirby the Dorkie is back with another recipe, this time to celebrate melon season! 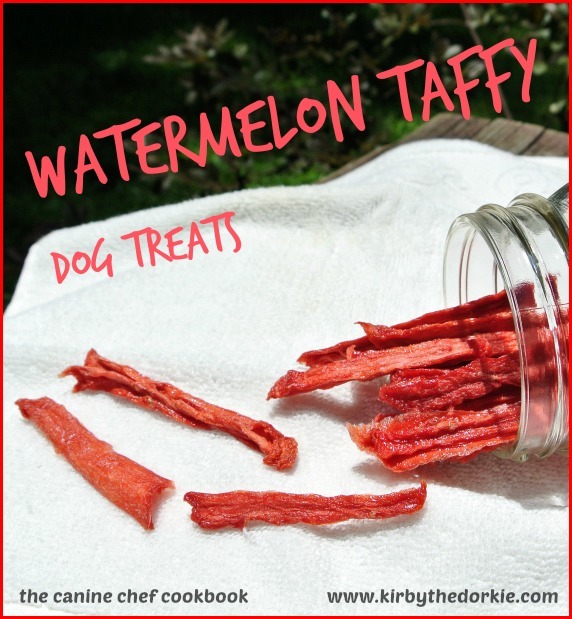 We're excited to introduce you to his delicious watermelon taffy dog treats, a quick and easy, one-ingredient recipe your dog will love! After you're done, try one for yourself... but don't fall in love with them and forget you made them for your pup! Read the recipe below, and then be sure to follow Kirby the Dorkie on Facebook and check out KirbyTheDorkie.com for more great recipes! Slice watermelon into strips. Keep in mind they will shrink by half when deciding how large you want your taffy to be. Place on saran wrap covered dehydrator trays. Dehydrate for several hours until it reaches desired dryness. Good quality saran wrap will not melt in the dehydrator. Mine have some moisture so I store them in a glass jar in the refrigerator for a few days. They don’t freeze well.